Understanding the theme of atonement as articulated in Revelation requires awareness of apocalyptic and prophecy, time and space, biblical and mythological imagery. Christ’s victorious self-sacrifice, as Revelation reveals it, is a counterintuitive notion whereby a slain Lamb defeats the Great Red Dragon. This overthrow of evil by God is hardly by any act of violence. God’s way of expelling the Accuser is by a much more powerful means than the cruelty and harm that Satan and his emissaries have inflicted on the world and its people through deceit, lies, seductions, and distortions of the truth. Satan, instead, is responsible for his own demise. Revelation calls believers to see themselves through the unique lens of redemptive atonement and to live and model daily that they see themselves in the present moment as redeemed people. Having thus seen themselves, believers likewise are directed to see and to relate to others in this world the very way that God has seen them from eternity. Robert W. Canoy is Dean and Professor of Christian Theology at the School of Divinity, Gardner-Webb University, Boiling Springs, North Carolina. Prior to joining the faculty of the School of Divinity, Dr. Canoy taught at Midwestern Baptist Theological Seminary and Boyce Bible School. Dr. Canoy has served as pastor, interim pastor, and guest teacher in numerous churches in North Carolina, Maryland, Iowa, and Missouri. Most recently he served as pastor of the First Baptist Church, Shelby, North Carolina. His interest in Revelation has spanned a lifetime. While many colorful threads exist in the tapestry of the Apocalypse, the thread of the atonement is not often teased out. Robert Canoy, with an adept and perceptive reading of the biblical text, traces this thread and illustrates it as a major focus both for the original audience and contemporary. This book will challenge readers to see the redemptive work of Christ through the apocalyptic lens of the author of the Apocalypse. In this careful, detailed analysis, Robert Canoy offers an insightful examination of the idea of atonement in the book of Revelation. Canoy demonstrates why Revelation’s redemption language needs to be under- stood in light of the book’s own historical and theological concerns rather than made to fit the views of other biblical writers or later theories of atonement. This is an excellent study of an often overlooked, though crucial, topic in the Apocalypse. Canoy’s work is the result of informed exegesis, critical dialogue with other scholars, and theological reflection on the significance of John’s understanding of the redemptive work of God (for ancient as well as contemporary readers). 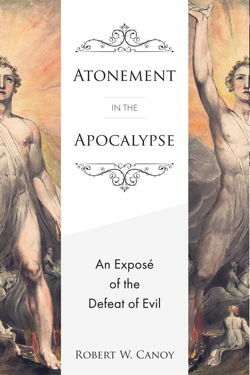 Atonement in the Apocalypse: An Exposé of the Defeat of Evil, is a fresh and insightful work that features the often neglected theme of atonement in John’s apocalypse. Canoy’s contribution offers a unique and refreshing perspective on foundational theological themes so prominently (and intricately) woven through John’s work. The work is solidly biblical, written with clarity for both scholars and laypersons in mind, and it challenges the reader to revisit important themes and images in Revelation that are either ignored or misappropriated in fanciful eschatological systems. Canoy’s work is a serious and helpful attempt to add yet one more voice to the conversation.